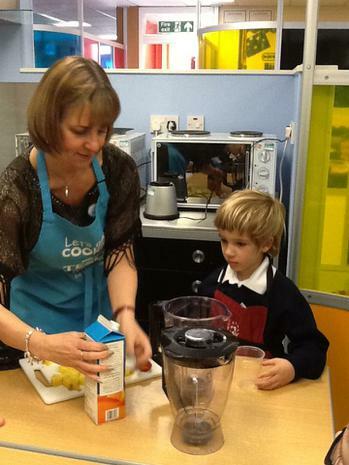 Normal morning routines will still apply – we will come into class and complete the register. At 9:10am, the Key Stage Two gate will open and you can meet your parents on this playground. Let the missions begin! Completing missions is thirsty work, so Friends of Wyburns will be providing refreshments, drinks and bacon buns, from 10:15- 11:00am. Please feel free to buy and share a refreshment and complete the remaining missions. We will then come back into class to continue our learning. Our shoe shop has been very popular this week. The children have enjoyed working the till, selling the shoes and measuring their feet. They have designed their own shoes, written about their favourite shoes and made some clothes for the elves. A busy week for everyone. This week we have enjoyed the story of The Little Red Hen. 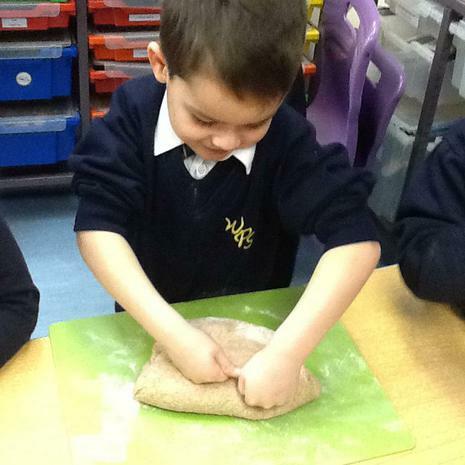 We have been thinking about where our food comes from and had a go at making our own bread. 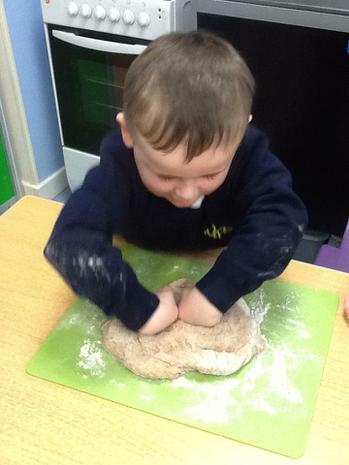 The children especially loved kneading the dough! Apparently it was the best bread ever! 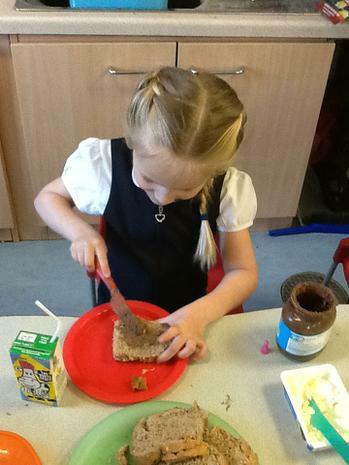 The children certainly enjoyed eating it for afternoon snack. We also became artists this week and worked really hard on producing pieces of art inspired by the animals in the story. 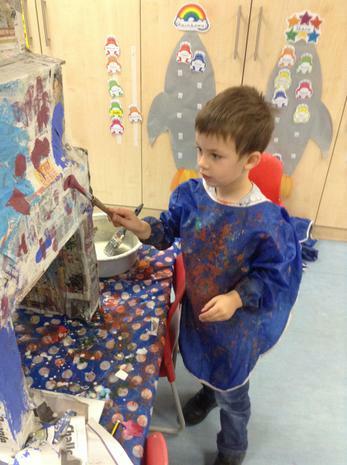 We worked on neat brush strokes and producing fantastic backgrounds for our art. The resulting gallery was amazing! Very proud of all of the children. 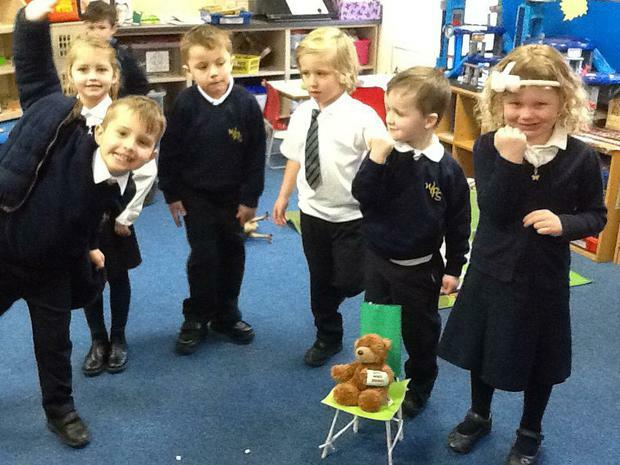 This week we have been enjoying the story of the Three Bears. 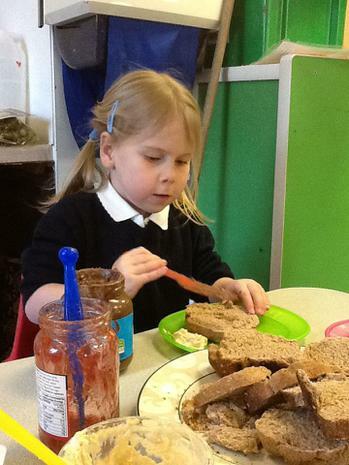 We have been thinking about weighing and comparing amounts using the scales and porridge oats. 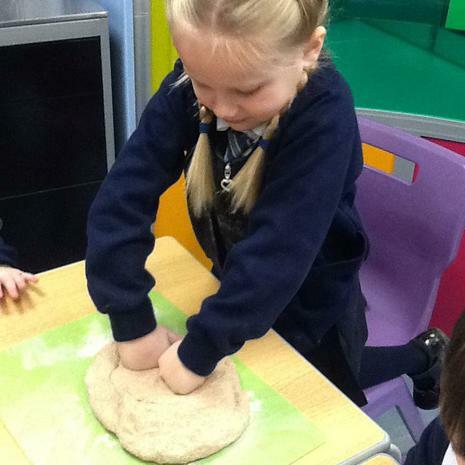 We have been using the words heavier and lighter. 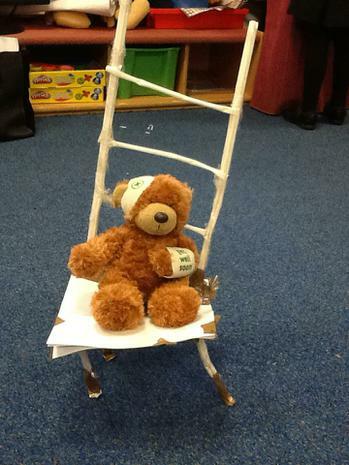 We worked together in teams to make baby bear a new chair. We had to listen to each others' ideas and solve problems as they arose. We think we did quite a good job and that baby bear would be pleased. See what you think of the photos below. We were very lucky to have a visit from a coach from the Deanes School, as part of their work to get young children active. The coach organised lots of brilliant team games for the children. We talked about the benefits of exercise and the many other ways that we can help to keep ourselves feeling good. The children listened beautifully and took part in the games with great enthusiasm. Well done class 1. 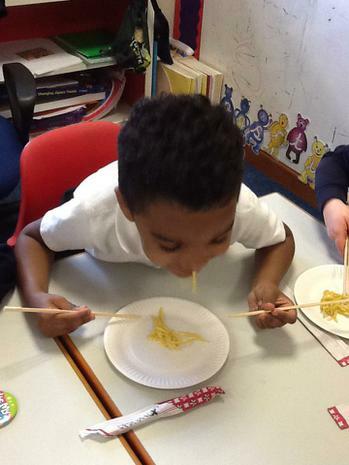 This week it was Chinese New Year. 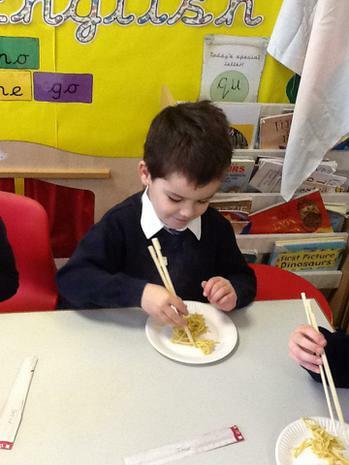 We have enjoyed thinking about the ways in which the Chinese celebrate. We have made lanterns and paper masks to represent the animals in the Chinese calendar. The children in our class were born in the year of the tiger or the rabbit. We also made special red envelopes that the Chinese children receive gifts of sweets or money inside. 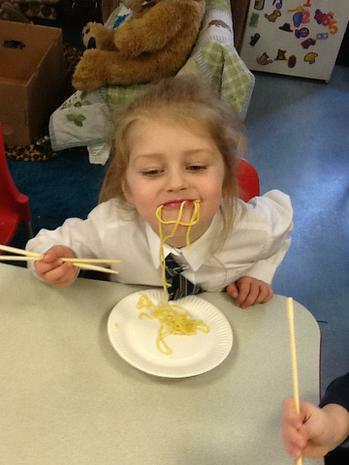 We even tried our hand at chopsticks! We had a lot of fun, although it was quite tricky. 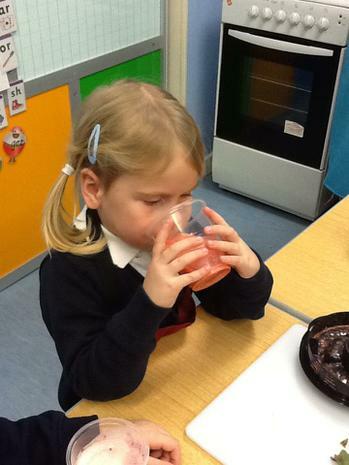 We have been talking about healthy eating and ways in which to keep our bodies healthy. 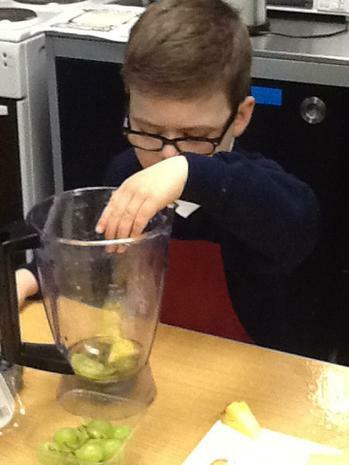 This week we designed and made our own healthy smoothies. Tasty there were too! A Successful Safer Internet Day! 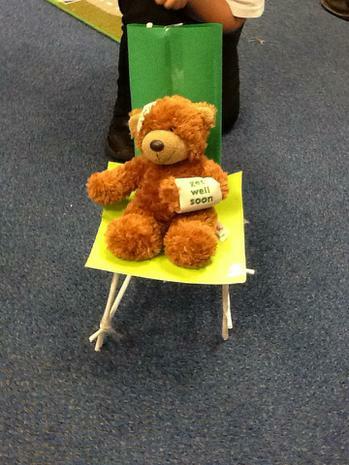 The children enjoyed learning all about how to stay safe when using the internet. We enjoyed a brilliant story about Smartie the Penguin, which can be found below if you wish to read it too. We made some beautiful hearts to share our messages of safety. The children then decided to build a super car that helped to fix everyone's computer problems. A lovely story for young children to encourage them to think when using the computer. 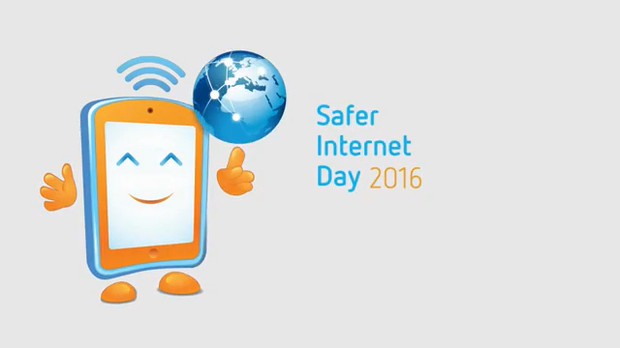 Don't forget that this Tuesday is Safer Internet Day. 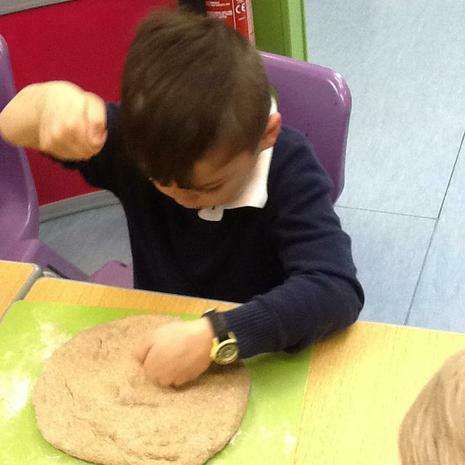 The school is running a workshop for parents straight after school on Tuesday afternoon. Childcare will be available during this time. Over the last two weeks Class 1 have been thinking about the story of the Wizard of Oz. The children have used their own images to create character collages, we have created puppets and props and put on our own shows as well as acting out the story ourselves. 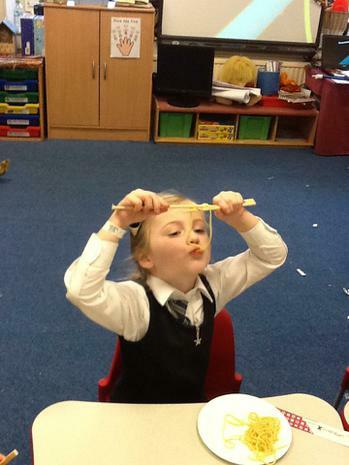 We have learnt about rainbows and what conditions need to be met to make one! There has been a lot of singing and skipping about on the yellow brick road! The children are becoming confident writers now. They now all have a phonics books to support them at home, revising the sounds we have learnt so far. I will add to these books as we progress with our learning. Encourage your children to have a go at writing at home as often as you can. Maybe they can help with the weekly shopping list or write down what they want to do at the weekend? Perhaps they could start a little diary, writing down the exciting things that they do. Look at my tasty Gingerbread Man! 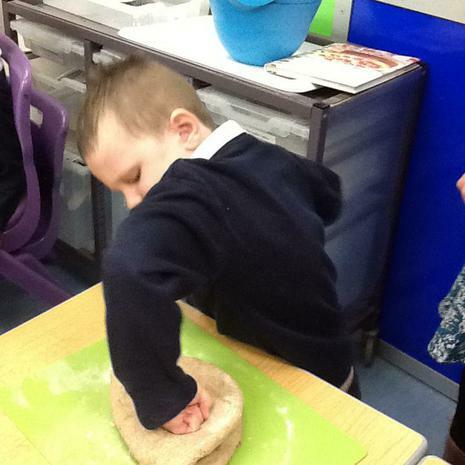 Brilliant work by Class 1 this week. 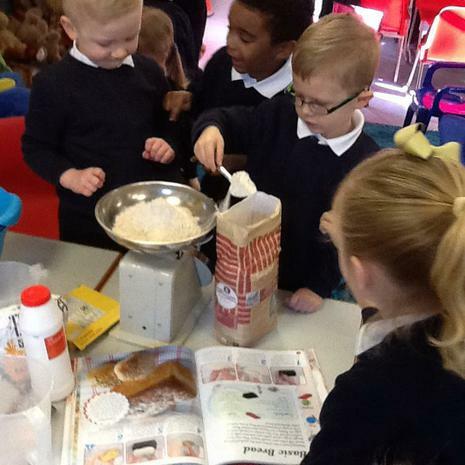 We have been weighing and measuring ingredients. We have been thinking about where the ingredients come from and how farms provide us with lots of different foods to eat. The children have made and decorated the most amazing gingerbread men. Yum Yum! It always tastes better when you've made it yourself! 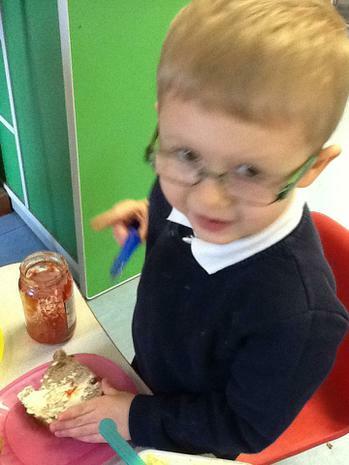 This week the children have been enjoying the tale of The Three Little Pigs. 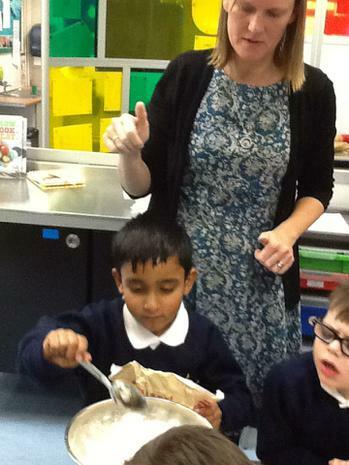 They particularly seemed to like the part where the wolf ends up in the cooking pot! 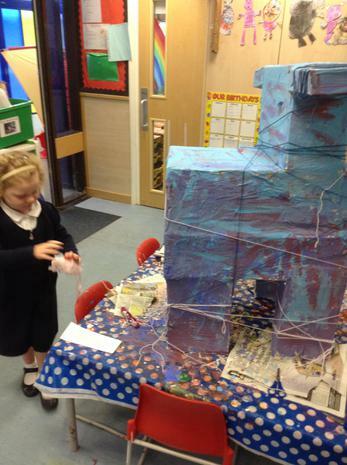 We have been working hard this week on building our own houses using a variety of construction materials. The children enjoyed our walk around the local area and were able to point out many different types of houses and homes. The children noticed details on the houses and then included them in a drawing of a home when they returned to school. We have used their artwork for our display in the school hall. 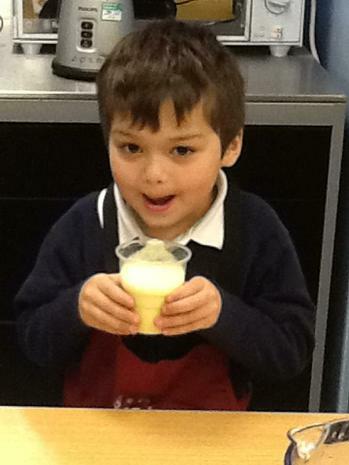 The children have had a brilliant first week back at school. 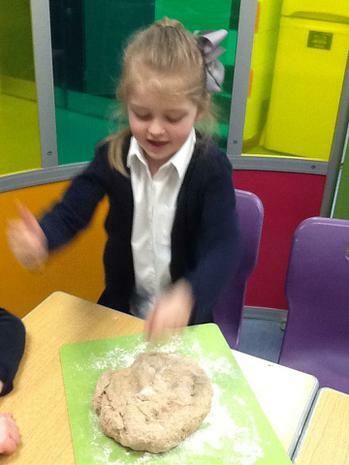 We have heard lots about the fun they have all had during the holidays. This week was friendship week. The children have enjoyed talking about their friends and deciding what makes a good friend. 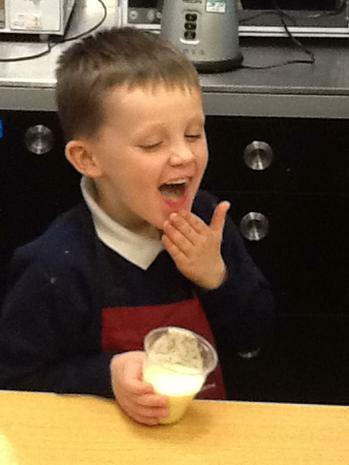 We have written a recipe for a good friend, which we pretended to bake and eat. This turned us all into extremely brilliant friends!!! The children worked on the computers to design a decoration for their friend. They listened carefully to their friend and used the colours that they liked. We have been learning the song, 'You've Got a Friend in Me.' 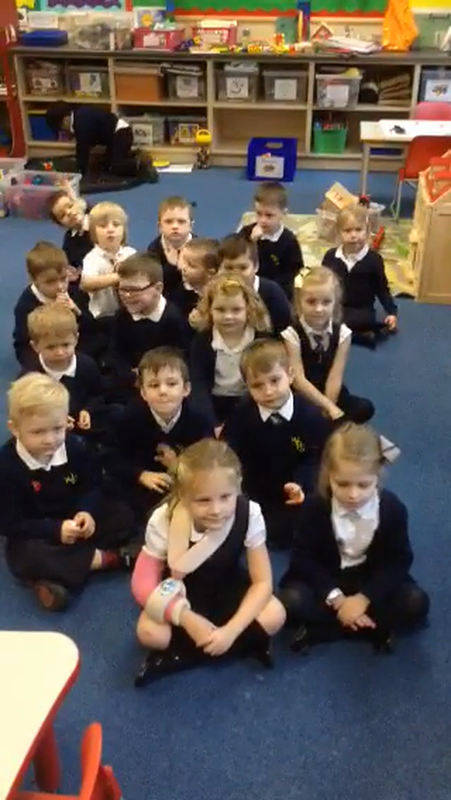 There is a snippet of the children singing below. Next week we will be starting our new topic on Traditional Tales. Thank you for the brilliant homework projects. Lots of children seemed to enjoy the tale of 'The Three Little Pigs', so this will be our first book of the topic. 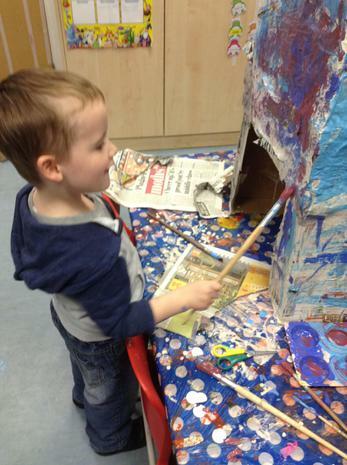 Next week we will be looking at houses and homes and building lots of things of our own! We are working hard on strengthening our finger muscles. 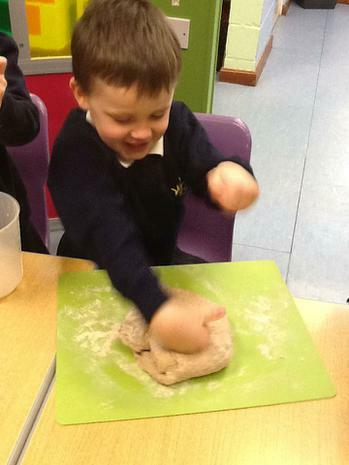 We have been enjoying 'Dough Disco', manipulating play-dough to music. Roll it, pat it, squash it, squeeze it, pinch it and poke it! For the last 2 weeks we have been looking at the story 'The Gruffalo'. 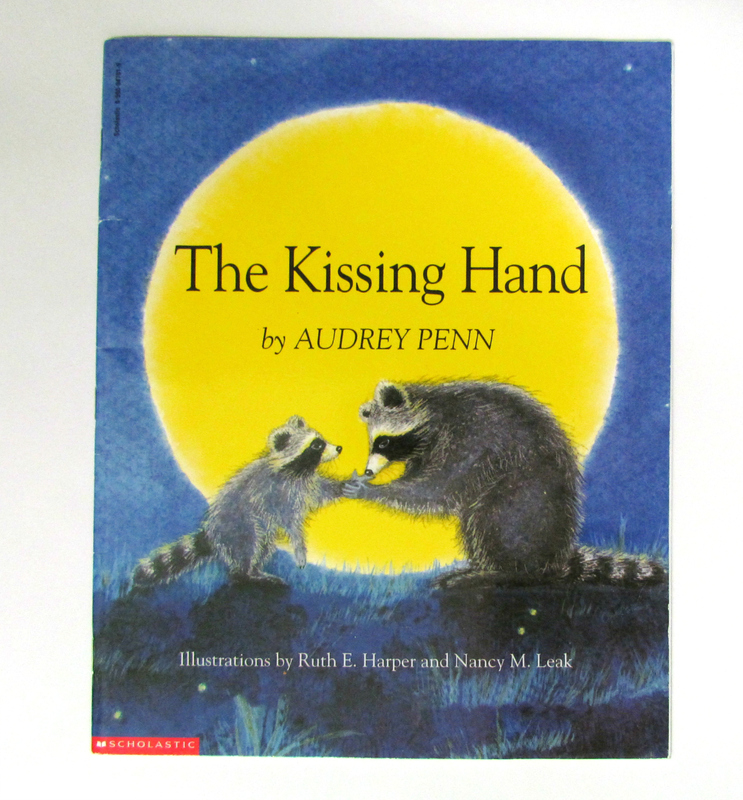 We have had a lot of fun with this book. 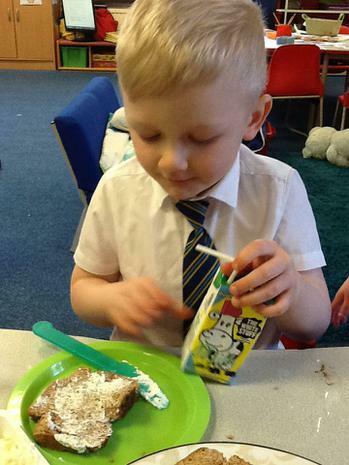 We have acted out the story, made clay models of the characters and set up a Gruffalo café serving scrambled snake, roasted fox, owl ice-cream and Gruffalo crumble! We have been practising using our thinking hats. We are using 2 different hats at the moment, red to think about our feelings and white to think about the facts that we know. A lot of counting has been going on over the past couple of weeks. 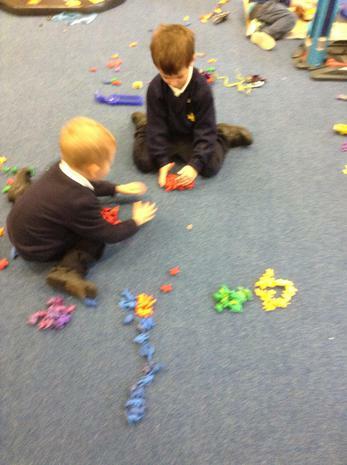 We have counted all sorts of things, getting really good at counting carefully and not missing anything out! Little Lou and the Woolly Mammoth! 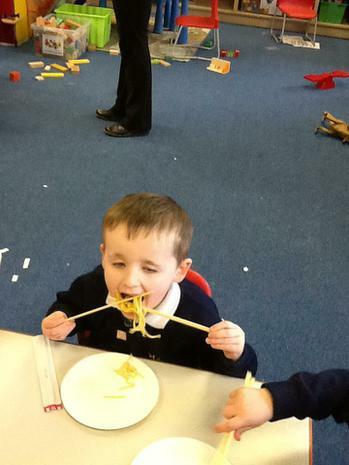 This week the children have had a lot of fun thinking about size. We have been measuring ourselves using string and comparing the heights and lengths of all sorts of things, from building block towers to role-play animals. 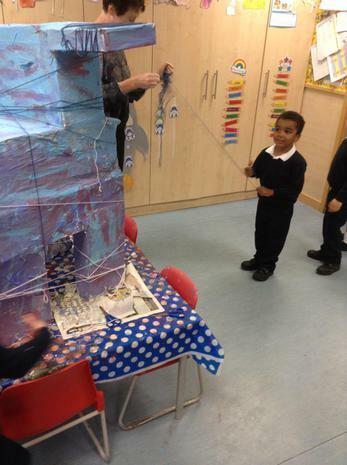 We made our very own giant woolly mammoth, just like the one in the story. We wrapped him up using a very long piece of wool! 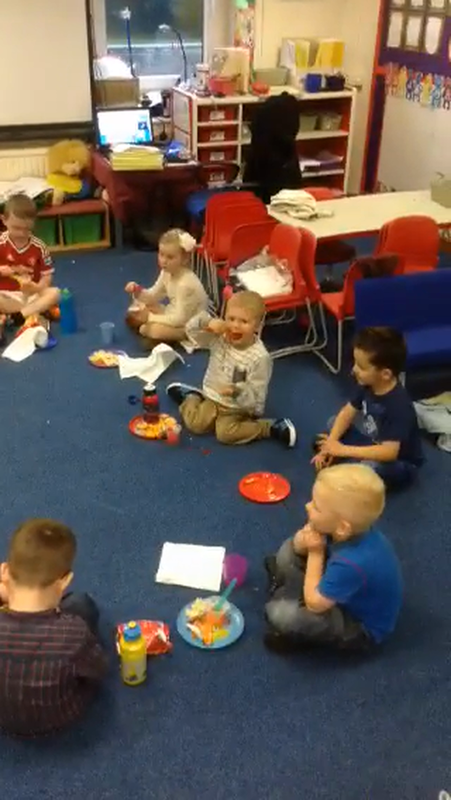 Friday was our class party. 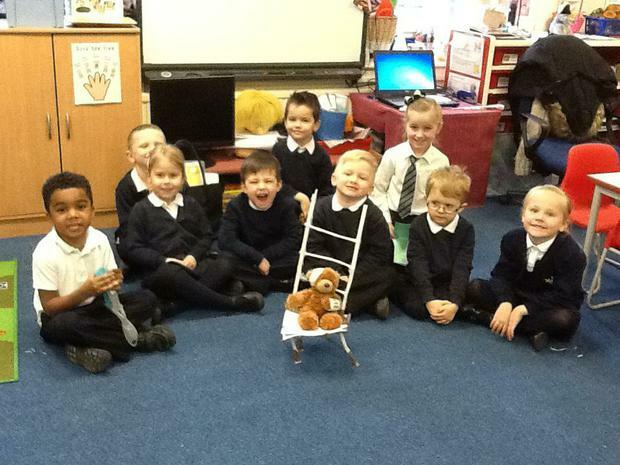 We all brought in a very special teddy from home to join us for the party. We had a great time playing party games, dancing and eating party food. 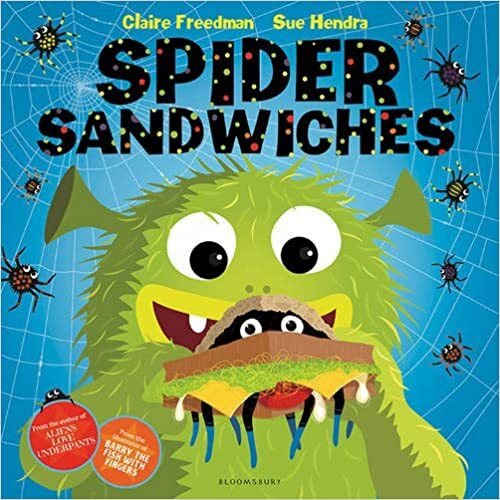 Yummy spider sandwiches! We have really enjoyed our yucky monster book of the week. The children have been busy looking out for spiders in the learning garden and trying to draw and photograph spider webs. We have spotted many beautiful, amazing looking webs. The children have been working hard on recognising rhymes this week and have even started to think of some of their own funny rhymes. We will continue to practise this next week! 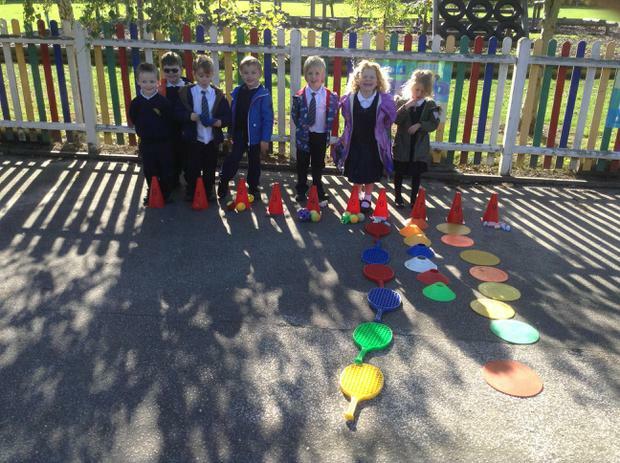 We have also been investigating shape and have been on shape hunts in the classroom and the learning garden. 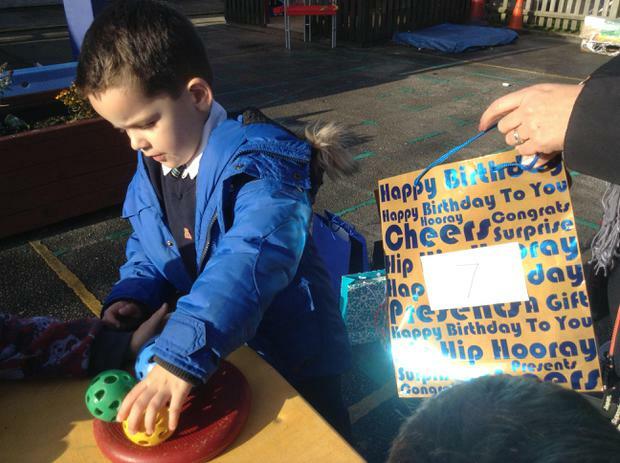 The children are brilliant at spotting and naming squares, circles, triangles and rectangles. Today was a brilliant day outside in the sunshine and I have included some photos to show you the fantastic teamwork we have been seeing! Making Mud Pies for Max Monster - Great teamwork, communication and sharing. Well done. What a brilliant first day the children have had today. I am so very proud of each and every one of them. Not a tear was shed, except by the parents! The children successfully negotiated the school building, enjoyed their first lunch and their first fire drill. I am sure they were all a little tired when they arrived home as they certainly kept themselves busy today. Wednesday 16th Sep - Individual school photographs. Thursday 17th Sep - Evening Echo photo shoot. Friday 18th Sep - Jeans for Genes Charity Day - wear something denim and donate £1 towards this fantastic cause. This is all about a little raccoon called Chester who is a little nervous about starting school. 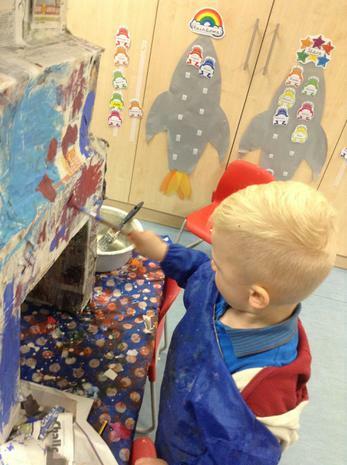 We have our very own Chester raccoon in our classroom and he likes to go on adventures at the weekends. At some point during the year your child will get to bring Chester home for the weekend. He always brings his diary with him so that you can record all the fun that you have together.